Is "It's ages since I last saw him" an example of ellipsis for "It's been ages since I last saw him"? Also, is it correct to say that "It's ages since I last saw him" is more common in BrE while "It's been ages since I last saw him" is mainly AmE? It's (it is) ages since an event or time in the past. It's (it is) ages until an event or time in the future. It's (it has) been ages since an event or time in the past. It will be ages until an event or time in the future. Both these modes of expression are common in BrE, and I am willing to believe that the first is rare, and the second is common, in AmE. Does anyone in this thread see any posts by me? I've made a couple, but can't see them. I tried entering one a second time and was told it had already been posted. Kinda strange. I am willing to believe that the first is rare, and the second is common, in AmE. This here sentence makes me think ya done seen one of the posts of mine that got deleted by some candyass admin, eh, centrox? That right? ... where the BrE/AmE different frequencies of usage are discussed. But what I mainly relied on is the excellent Google Ngram Viewer. 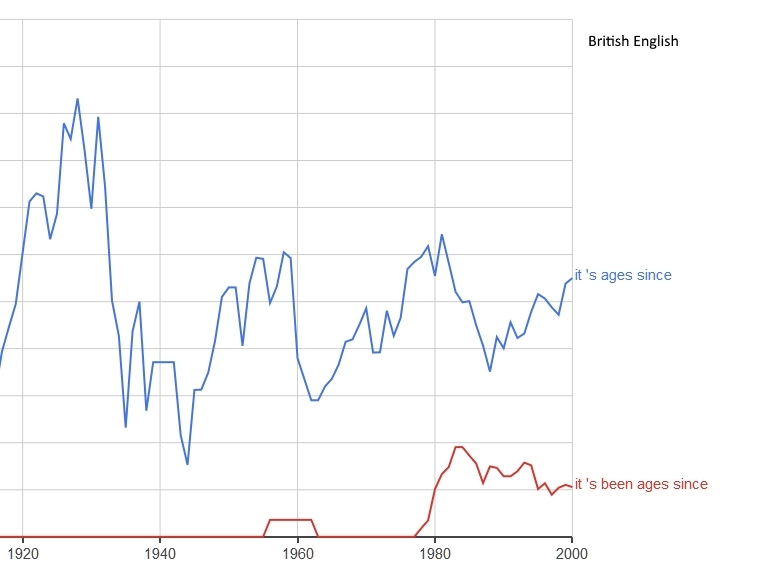 You can see "it's ages since" was the majority usage on both sides of the Atlantic until about 1980. It's the question contained in the original topic starter post. Yeah, I know that. But you didn't see my (deleted) post, which preceded yours, and which addressed this question, so you don't know the context of my question. To repeat, I said everyone I know includes "been" but I didn't know about Limeys. I also noted, for the hell of out, that a certain segment (mainly black) routinely omits linking existential verbs (or whatever you call them). The example I gave was that instead of "It is free" they will merely say "It free" as a shortcut, treating the "is" as implied. If this relatively small segment does use a linking verb, it is usually "be," regardless of the context: "It be free." For them "is," "are," etc. just don't exist. Don't ax me why. regardless of usage, "it is ages since" doesn't make grammatical sense to me. The "since" clearly indicates a reference to the past, so "it has been" would logically follow to me. Would you say "It is many years since," or "it has been many years, since?" You're talking about a finite duration of time which "has passed." Put another way, "Many years have passed since..." No one I know would say "Many years is passed since..."
To repeat, I said everyone I know includes "been" but I didn't know about Limeys. This confrontational tone does you no favours ("favors"). "Ages" means the same thing , in the topic under discussion, as "a long time", and English language forums are full of Americans telling people that "it's a long time since" is "wrong" (because they've "never heard it" and/or "it doesn't make sense"), and Brits, Irish, Australians, Kiwis, South Africans, Indians, Nigerians, Kenyans, Hong Kong Chinese English speakers, etc, gently or not so gently, pointing out otherwise, quoting sources like the Oxford English Dictionary. 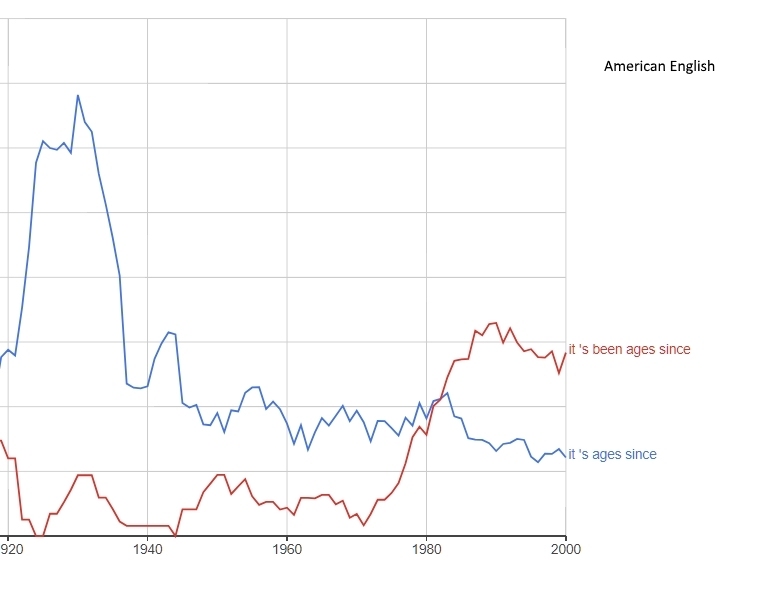 You can see "it's ages since" was the majority usage on both sides of the Atlantic until about 1980. This is slightly puzzling. If this is so, why are so many Americans convinced that the "been" is compulsory, and its omission so very, very wrong? globally - which is used more? BrE or AmE? Then British English started changing in ways American didn’t. The ‘proper’ English of the early 1600s would sound to us like a cross between the English spoken in Cornwall and Dallas; the accent has changed more in British English than in much of American. "It's been ages since I last saw him" is mainly AmE? I said; "regardless of usage, "it is ages since" doesn't make grammatical sense to me." Your response nonetheless seems directed toward "usage." I wasn't talking about that. I was talking about "sense." I didn't say anything was or wasn't "wrong," I was, again, talking about what "makes sense" (to me). It's two entirely different things. For some reason, you bring in the phrase "a long time," which is inherently temporal and where questions of tense would naturally arise. But you only seem to talk about what people do. A lot of things people commonly "do" don't really "make sense." An interesting question. Native or sole speakers, I would say about 100 million worldwide (I have excluded Canada's 20 million), but there are 80 million in Nigeria (de-facto national language for government, business and education) who speak it in addition to their local language, and 125 million in India. More than 50 million in Pakistan. American English has about 225 million native speakers. Anyhow, numbers, and/or "my local usage" don't determine what is "right" and "wrong". Anyhow, numbers, and/or "my local usage" don't determine what is "right" and "wrong". while my usage is more BrE than AmE, I would recommend to any aspiring academic or professional than they focus on AmE. It will serve them better in the long run. I feel particularly bad for people who learned English in India. When they come to North America and tell people that English is their first language, they are pretty much disbelieved. The Indian variant has travelled so far from BrE and AmE to be almost useless. Many Indian students coming to Canada have to study EFL to be able to proceed with their planned studies here. American IS a language. That's my story, and I'm stickin to it. As the linguist Max Weinreich said, a language is a dialect with an army and a navy; the US has been an independent country for more than two centuries – and boasts the world’s most powerful examples of both. Americans felt most free – even obliged – to take linguistic liberties once they had taken their political liberty. As Noah Webster wrote in his 1791 Dissertations on the English Language, “As an independent nation, our honor requires us to have a system of our own, in language as well as government.” Not that all Americans felt the same. Throughout the 19th Century there was a great dictionary competition: between Webster’s deliberately American approach (his first full dictionary came out in 1818) and the much more British-orientated approach of Nathaniel Worcester (whose first dictionary was published in 1830). Which won out in the end? Well, we know, don’t we? No one today has heard of Worcester’s dictionaries. The Americans opted for a distinctiveness to mark their independence.
. Webster promulgated many spelling reforms....Webster’s dictionaries were the prime vector include changing centre to center, defence to defense, connexion to connection, and chequer and masque to checker and mask. His removal of the k in words such as magick, musick, and logick even came to be the standard in England. ...While many Brits are quick to denounce Americanisms where they see them (even ones that, as we have seen, came from England first), quite a few words of American invention have been adopted into British English, including belittle, caucus, prairie, cloudburst, blizzard, cafeteria, cocktail, talented, reliable, and influential. Newsflash for Limeys: The war's over. We won. Would you please give me some examples of Americanisms that "came from England first"? That's not my statement, I was quoting the author in the link supplied. He gives some examples, I think, but I didn't quote them.